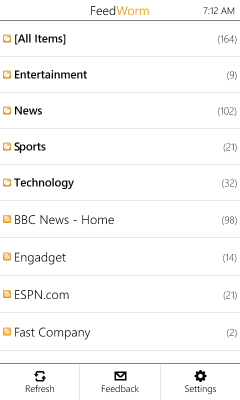 A little over a year ago, I got tired of searching for a Google Reader client on Windows Phone that worked exactly how I wanted. So I started writing one myself. My plan was to create a simple, efficient app that began by doing as little as possible - and gradually add more advanced features as time allowed. My goal was to understand the complete end-to-end experience of writing and publishing an application in the phone ecosystem. I released the first version of FeedWorm one year ago today. It was free then; it remains free now. And while FeedWorm has a few more features today than when it started, it's still very much an exercise in minimalism (which helps keep it fast! ).